This superb waist trimmer is slightly longer (1cm) in length covering more of your torso area, compared to the Couture Collection. It offers concentrated compression yet it is remarkably comfortable to wear. The MASKATEER Couture-L blue waist trainer is perfect for those wanting to take inches off their waist immediately for that special occasion or looking for something to enhance your curvy hourglass figure. 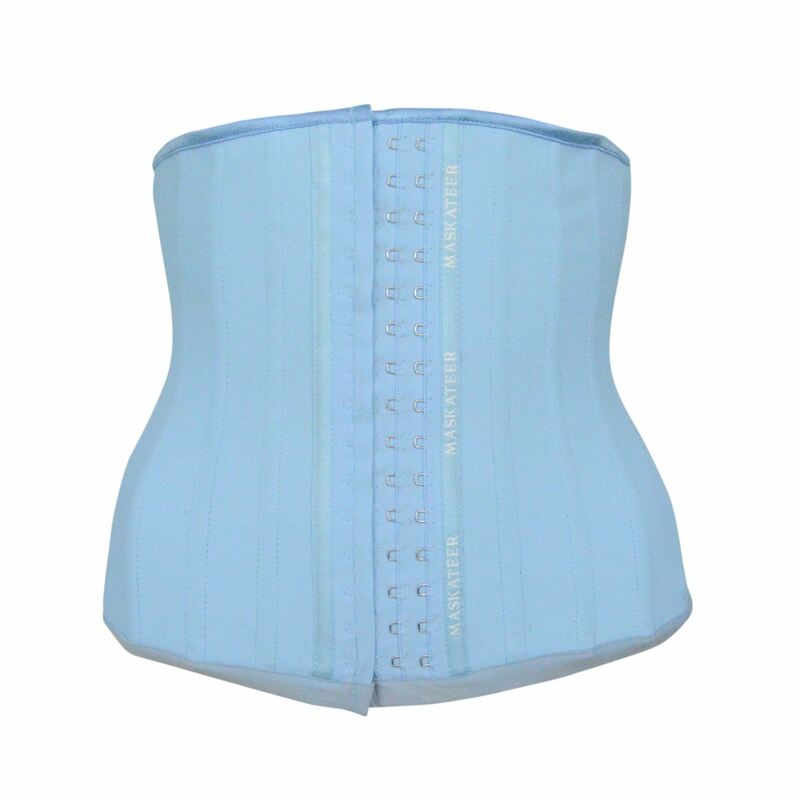 For those of you with back pain and bad posture, look no further, as this wonderful Couture UK waist trainer helps provide better back support and corrects posture. The MASKATEER Couture-L blue waist shaper is discreet under clothing allowing you to wear it throughout your day to day activities with effective thermal activity in your torso area. It is slightly smaller in length for those of you that have a shorter torso providing a tailored made fit. Others can wear the Couture-L waist belt during light exercise for faster results. This product is like no other on the market in terms of quality, performance and comfort, with 25 stainless steel flexi bones, durable and stretchy rubber latex material and 100% inner cotton lining. MASKATEER takes care of your needs by providing professional, helpful, high quality service and assistance before, during, and after your purchase; delivering arguably the best customer service in the industry. The MASKATEER Tender Aroma Cleaning Spray is made from natural ingredients and helps maintain your waist trainer so you can make the most out of it. The MASKATEER cleaning spray targets stains, sweat and bacteria leaving you a clean looking waist trainer every time. The MASKATEER Gym belt has some amazing benefits such as: Amazing back support during workouts, Reduces the possibility of injury, Helps maintain posture, And very comfortable to wear. With regular weight training and exercise whilst wearing the toning belt it: Helps with weight loss, Increases thermal activity in torso area, Makes you sweat more, Burns more calories, Removes excess water weight, Burns fat faster, And removes toxins from your body.